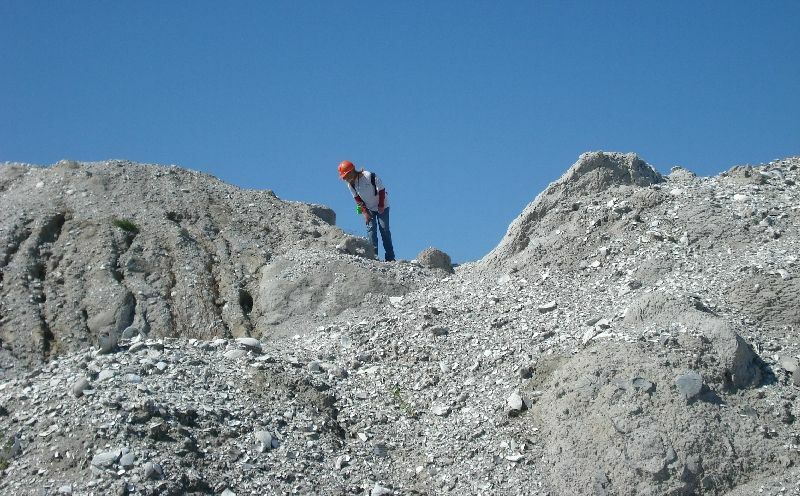 Aurora, North Carolina Fossil Hunting Trip Report - Megalodon Shark Teeth! Megalodon Shark Teeth Hunt! Christmas in September! 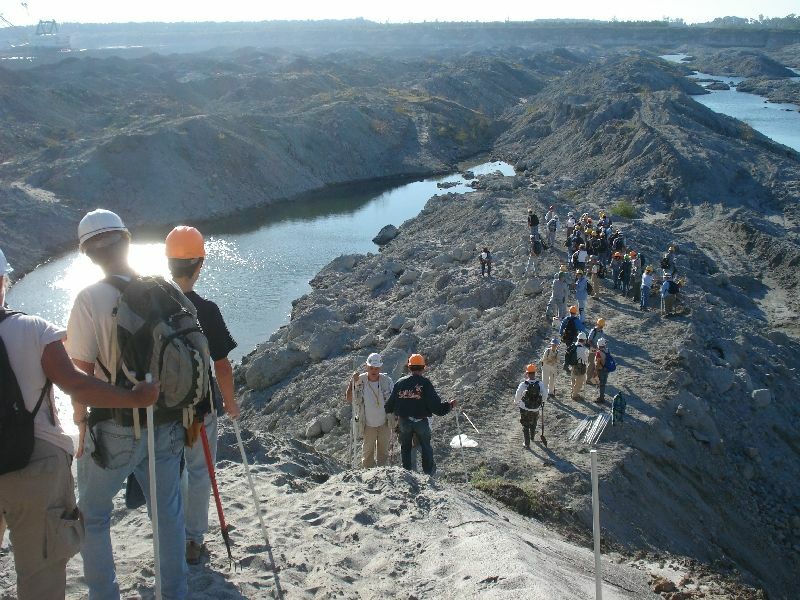 Collectors entering the mine. This is the kickoff of the Fall 2007 collecting season. Getting into the actual pit was kind of like playing on a jungle gym. 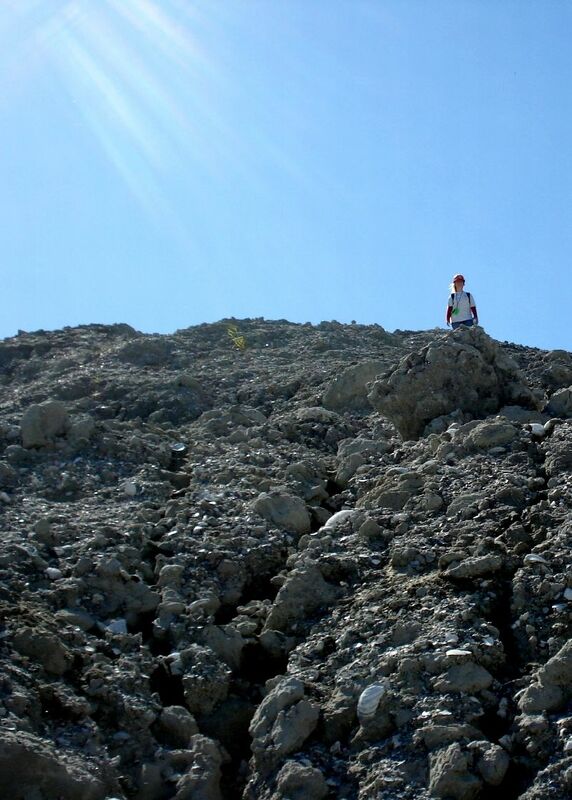 The trip leaders said we would have to climb down a steep hill of loose sand. To avoid sinking, we would walk on a rope. To get back out, we were to walk on the rope and climb up with an additional rope. Images of clowns at a circus doing back flips and Chilean acrobats swinging from ropes danced through my mind as the fossil collectors, one by one, awkwardly shuffled down the rope. Once in, it was like Christmas for a 5 year old. One could walk for over an hour in one direction and hunt on hills void of collectors. 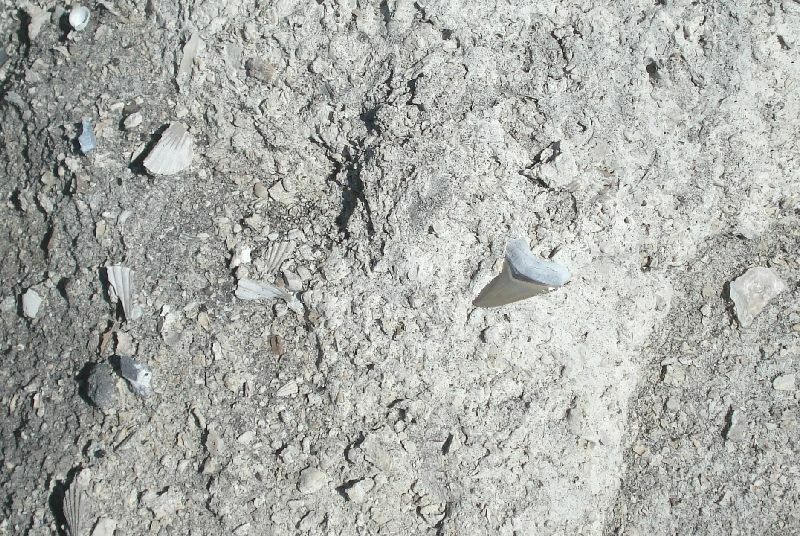 The only problem was the new area was not well eroded, so the fossil shark teeth hid really well in the sediments. I know I must have walked by a bunch of nice fossils! Even so, Amy and I came out of the mine with a bounty. 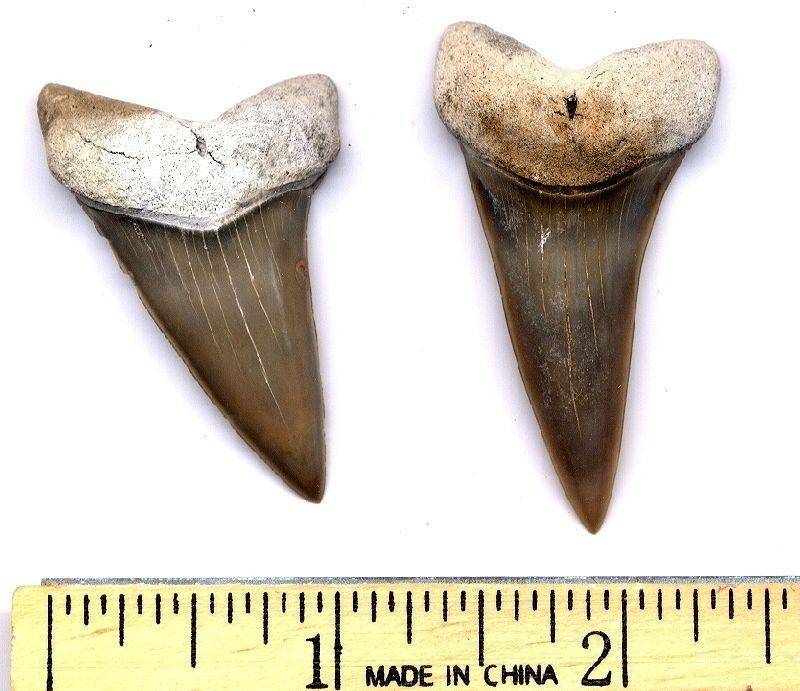 Many people found large fossil megalodon teeth. Amy and I only found a few small ones, but tons of other interesting fossils were found. It was a great day at Aurora for the entire collecting group! The next day Amy and I hit Green's Mill Run for a few hours to look for a great white tooth before heading home. 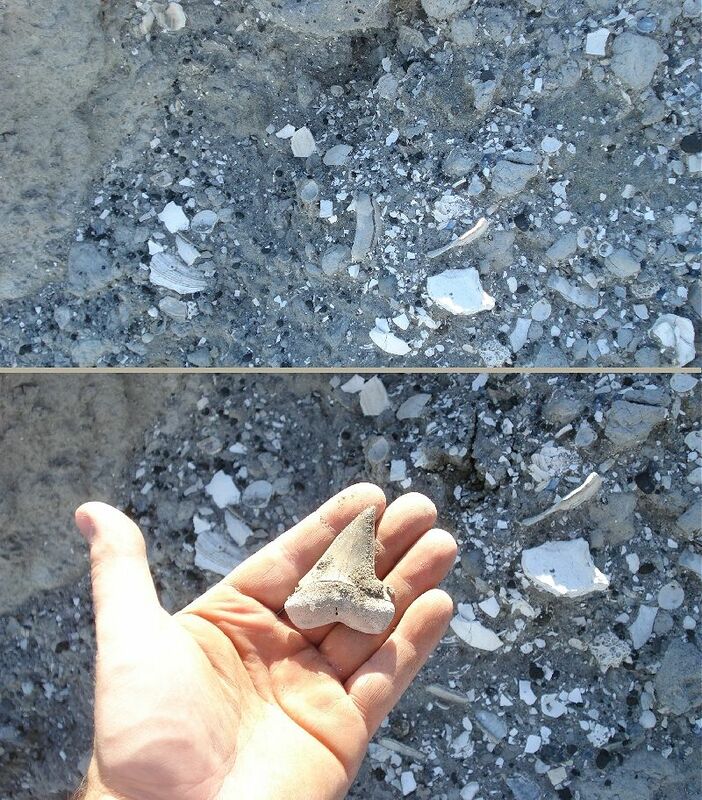 We didn't find any complete Great Whites, however we managed to find a worn Mosasaur tooth and a pathological Squalicorax tooth. Thanks PCS for allowing us to collect! We all greatly appreciate it! Be sure to also check out Ditchweezils collecting report of this day. Be sure to check out the new Friends website, Friends of the Museum. The 2007 fall season area is vast. Amy found this small meg in a chunk of Pungo Limestone. I broke my hammer trying to get it out! Here is a 2 1/8" mako that I found. Here are our finds for the day. No large megs were found by us. However we found a bunch of makos and some smaller megs. I was looking for porpoise finger digits to complete my porpoise hand, but managed to come back with one seal and a bunch of whale finger digits. Go figure! 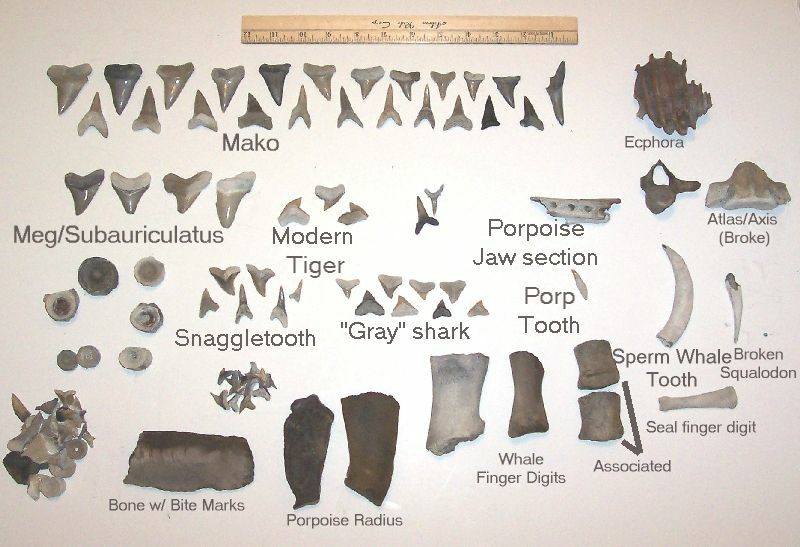 Missing from the picture is the pile of large whale bone and verts and the standard fish material. These are a few of the larger Broad-form mako teeth found. 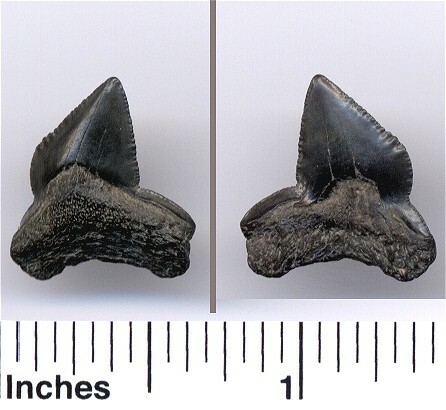 These are a few of the larger narrow form mako teeth found. 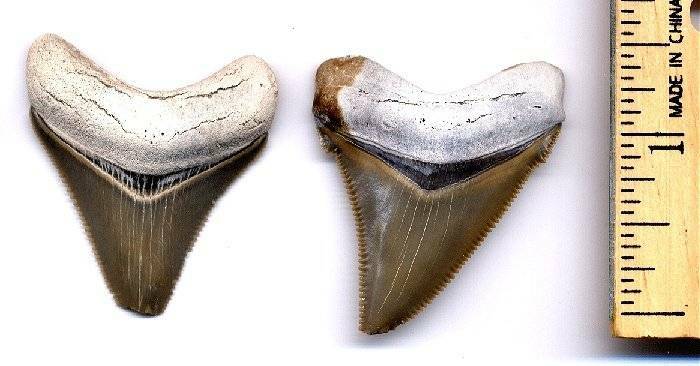 Here are two juvinile megalodon or subauriculatus teeth. This is a seal finger digit. 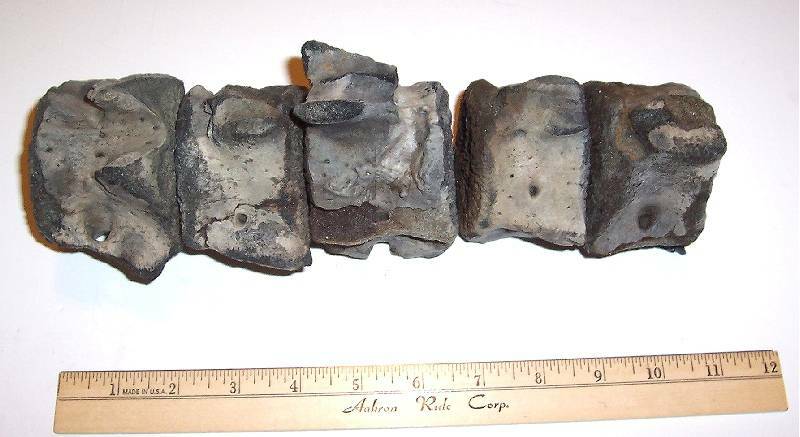 Here are some associated juvenile whale vertebra. They are pretty banged up, but come from the same animal. Green's Mill tooth: I wasn't sure if this tooth was pathological or an incredibly unusual tooth position. 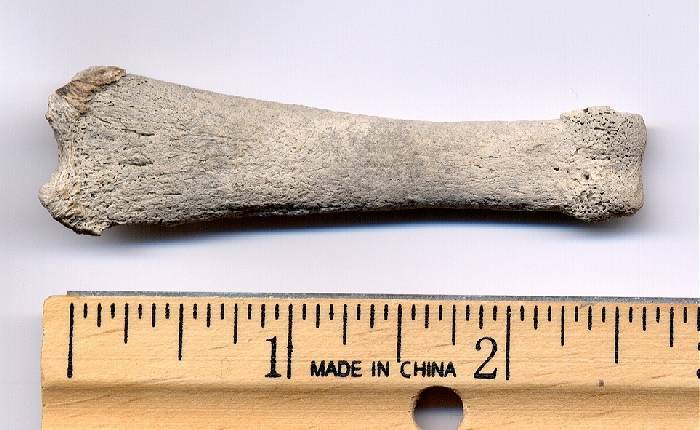 However, a web site visitor (who posts on Black River Fossils) informed me he has also found this squalicorax tooth form in the Alabama Cretaceous. So this may represent some brief time period where the squalicorax tooth form resembled this instead of the standard tooth form. Further study is definitely needed! 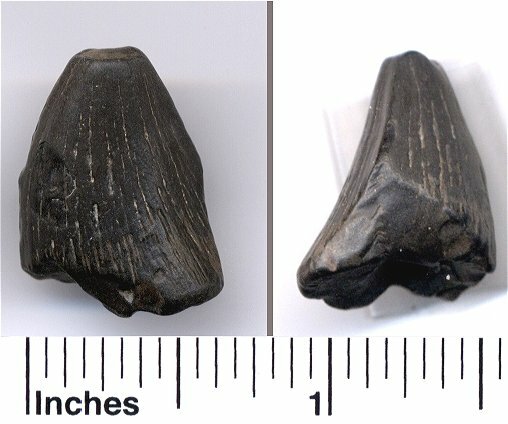 Green's Mill fossil: Here is a worn Mosasaur tooth. This is our first from Green's Mill Run.